LONDON (BLOOMBERG) - International investors who have paid millions of dollars in down payments on new luxury homes in London's biggest residential development are being squeezed between a more expensive pound and slumping real estate values. Malaysians who bought units under construction in the Battersea Power Station site from May 2013 have seen costs surge as much as 35 per cent as the pound strengthened against the ringgit. Kuala Lumpur-based developer Sime Darby Bhd. said management and their families bought US$12.8 million (S$18 million) of the homes costing from Â£338,000 (S$741,400) to Â£6 million. The first phase is set for completion next year. The value of luxury homes in the Battersea and Battersea Park district fell 10 per cent in the 12 months up to June, according to broker Douglas & Gordon. Investor confidence has been undermined by higher sales taxes introduced by Chancellor of the Exchequer George Osborne in December, which climb to as much as 12 per cent of the cost of the most expensive homes. "A lot of these purchases are linked to political risks in Asia and concerns about an economic slowdown in emerging markets," said Mr Joe Valente, head of research and strategy at JPMorgan Asset Management in London. "A sharp appreciation of the pound could certainly have an impact." When the Battersea project was first marketed in 2013, a weak pound spurred demand from international investors and the number of new London apartments and houses due to commence construction surged to the highest in at least 26 years. Interest is now waning, with the number of Asian investors buying properties in London's best locations falling in the first half of the year, according to data compiled by broker Knight Frank LLP. "We are witnessing softening of interest among buyers from Malaysia and South-east Asian regions, probably due to the prevailing volatile currencies and uncertainty in economic outlook," Sime Darby, which owns 40 per cent of the Battersea project, said in a statement. "No exchanged contracts have been cancelled to date." 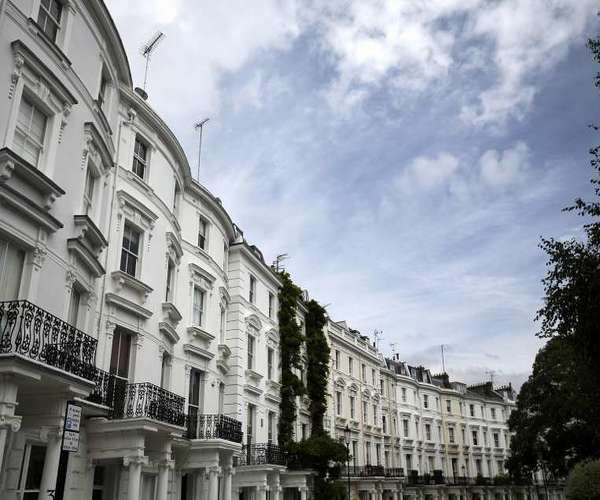 Malaysian buyers accounted for 0.6 per cent of prime London homes sold in the first six months, compared with 0.9 per cent in the previous period, while Hong Kong-based purchasers dropped to 3.3 per cent from 5.6 per cent and Singapore investors fell to 1.4 per cent from 3.8 per cent, Knight Frank said. Chinese homebuyers fell to 9.4 per cent from 10.9 per cent. The pound has gained more than 14 per cent against the Singapore dollar since May 2013, and 4 per cent against China's yuan. The worst hit investors are the Russians, with the ruble depreciating 55 per cent against the pound in the period after sanctions were triggered by President Vladimir Putin's annexation of Crimea last year. Purchases by Russians slumped to 2.9 per cent in the first half of the year compared with 6.7 per cent in the previous six months. While values have started to fall in the Battersea area, investors are being cushioned by increases from 2013 and 2014. Prices in the South Bank district, which stretches from Battersea Power Station to Tower Bridge, climbed 22.8 per cent since January 2013, according to Knight Frank. The decline in international buyers is hurting presales of homes in the UK capital. The number of London apartments and houses sold before they are completed fell 27 per cent to 5,109 in the second quarter from a year earlier, according to broker Chestertons, citing data compiled by Molior London. "The London property market is an extremely risky buy at moment regardless of exchange risk and especially at the top end," said Paul Cheshire, professor of economic geography at the London School of Economics. Developers are competing to sell 18,000 new homes planned for the Nine Elms neighborhood, which includes 4,000 at Battersea Power Station. They're also having to contend with buyers trying to flip the apartment purchase contracts before they have to complete the purchase and pay sales taxes. "Given the movement in the pound over the past two years our model would predict a fall in the price of prime central London to the rest of the UK of 10 per cent to 15 per cent." said Philip Lachowycz, an economist at Fathom Consulting in London. "In our judgment, most of that is yet to come."